Donate a Recorder to a Student! In lieu of receiving a benefit, WDAV will donate a recorder to a local school to help a student pursue their musical dream. 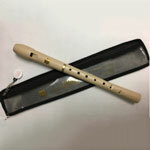 This Harmony Renaissance Style 2-piece Ivory Soprano Recorder includes a protective bag with a WDAV zipper closure and cleaning rod.